A better image! Great job! And what a great card! Thanks, Julie! Well, that led to a great deal of discussion about stamping tips and techniques for getting the best results from your stamps! There is no better time than Tutorial Tuesday to share these things and so, here are a few basics about stamps and a few good tips too. 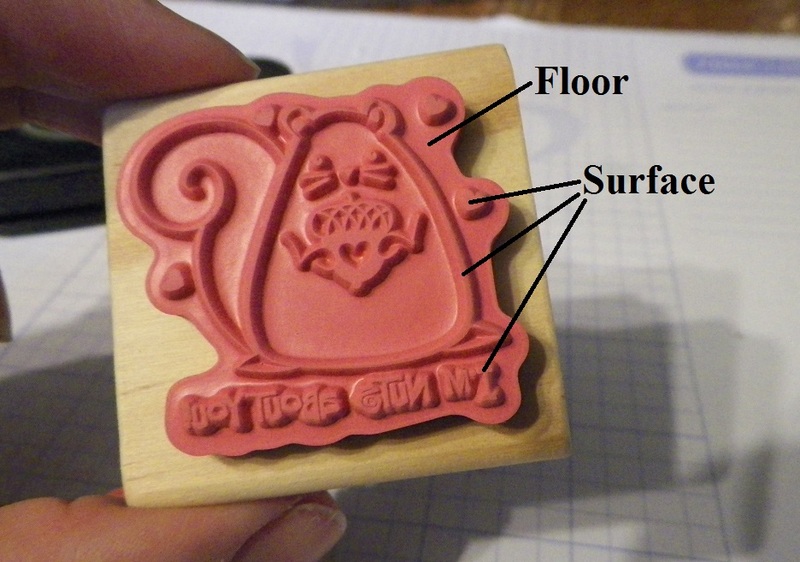 The main parts of the rubber (or acrylic) part of stamps are the floor and the surface. The surface is the part that you ink up. The part of the stamp between the floor and surface is actually called a "shoulder." As a general measure, stamps with a taller shoulder stamp more clearly. Stamp anatomy - side view. 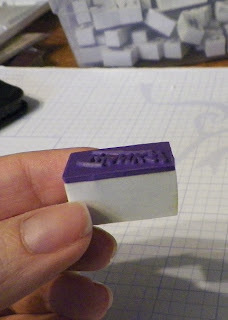 ﻿ Looking from the other direction, you see the "cushion" or foamy, squishy layer that is in between the stamp and the block that it is adhered to. Blocks are traditionally wood, plastic, or acrylic. 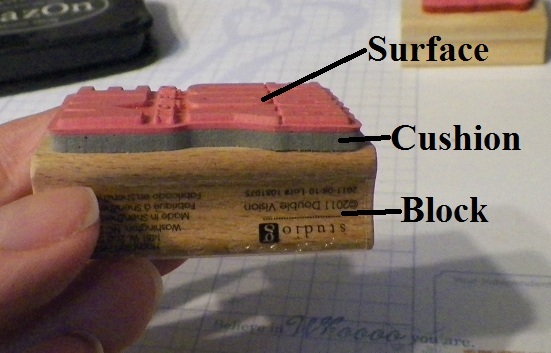 Beware of rubber stamps that are mounted to wood without any cushion in between! 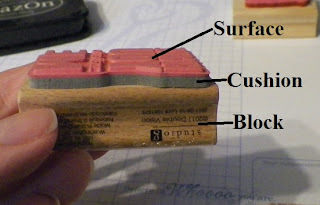 A rubber stamp mounted on a foam block. Some inexpensive stamps are even mounted on a foam block. While not my favorite kind. . . foam block stamps can actually produce a very crisp image! The reason for this, is in the foam. The foamy, squishy layer acts as a small spring... when the stamp is applied to paper, the foam ensures an even pressure for a more crisp, even image. See how the "shoulder" area of this stamp however, is not as tall? These stamps are from Stampin' Up! These Stampin' Up stamps, and some other kinds of stamps, come ready to assemble. (Those blue rubber stamps come to mind...) You have to mount the rubber to the foam by yourself. Sometimes this requires some cutting, labeling and mounting to your own blocks or whatever you prefer to use. In my case, it also usually involves some cussing. :) I like my stamps best, when they are ready to use! But I do love them all... I love that some companies give you the option to choose for yourself if you want to purchase your stamp in traditional rubber, or clear acrylic. Many companies also offer acrylic stamps and you can find them in many stores. They are usually less expensive than traditional, wood mounted rubber stamps. Their big allure is that their transparency also makes it very easy to see exactly where your stamp is placed on your project. No more guessing if that sentiment is going to come out crooked or close enough to the image... clear stamps make it very simple to see. They also store nicely because you just peel and stick them to your own re-usable acrylic blocks. Here is what a lot of people forget about when using their clear stamps though... there is no squishy cushiony foamy layer! In the photo above, you can see the foam pad that this company includes in the packaging with each stamp set. For best results, the foam pad is placed underneath the paper that is being stamped on. At first, this seems very awkward and backwards from the usual rule of stamping on a smooth, flat surface but it is very effective! Many clear acrylic stamps are sold or packaged without any foam pads or instructions for using such a thing. I can't tell you how many beautiful acrylic stamp sets I got frustrated with for not "stamping right" before I realized the missing foam layer. Some manufacturers suggest stamping with their acrylic stamps on a self-healing mat or rubber mat, others find that a mouse pad is a great surface for stamping on to get that clear, even result. Experiment, and find out what works best for you! While this may seem pretty self-explanatory, a flat-surfaced paper works best for stamping on. Don't expect to get a very clear image on paper that is textured, even lightly so. Sometimes stamping on textured paper is fun for making textured stamped flowers or shapes... but when stamping a black-outlined image, a sentiment or using embossing powder, smooth-surfaced paper is the very best option. Don't add your stamped image as the last step of making a card - in other words, building the perfect card with lots of layers and then stamping your sentiment or image on it last... is a recipe for disaster. Always stamp your sentiment and image first, then add them to the completed card after you are satisfied with the finished result. It's ok to stamp your image many times, and choose the one that turns out best! Stamped images are sometimes like snowflakes, no two of them turn out exactly the same. Especially when you are just learning! 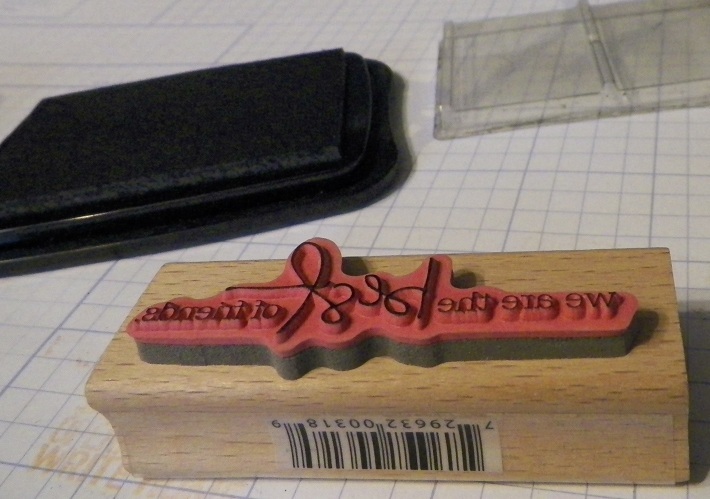 Priming a new stamp for first-time use. Stamp with the stamp on a piece of scrap paper. Note where areas are that may need more ink or pressure. Do not rock your stamp around when stamping with it. Put it down on the paper with even pressure and avoid moving it around. Pick the stamp back up without rubbing it across the paper... and yes, this does take practice! Your primed stamp is now ready for using any kind of ink. You will find that priming first with a solvent ink will make a water-based ink stamp more evenly. Give it a try! While surfing around for some stamping information, I found this video by our friends from Hero Arts about how stamps are made. Fascinating! Feel free to also offer your own thoughts, suggestions, questions or advice about stamps by commenting below. Now that we are all inky and we played with all of our stamps, how do you like to clean yours? Are you a washer? A wiper? A scrubber? A stamp-until-the-ink-is-all-goner? Discuss! :) By helping each other out, we make even better cards for our heroes! What a great post! I have been stamping for years and I have always disliked the clear stamps for the reasons that you mentioned. I am going to try using them on a rubber mat to see if my images turn out better. Thanks so much! Nancy, this is a fantastic tutorial! I learned so much. For cleaning, I like to use a baby wipe. 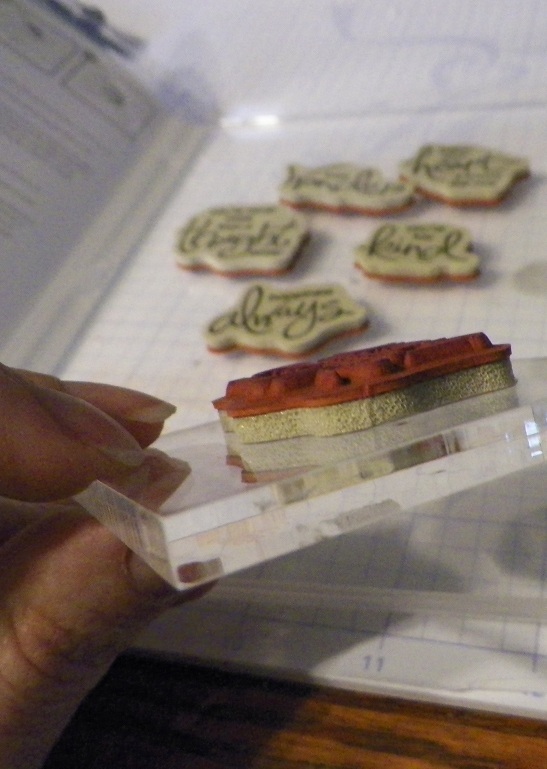 Also, I like to stamp on my glass mat and NOT on my craft table which seems to have some "give" to it. Thanks for sharing all of this great info! I was thinking of mounting foam to a piece of wood to help with clearer images since most of my stamps are clear and my table has "give". My very first stamping class I took, the instructor told us not to buy the expensive cleaning pads and cleaning fluid. She told us to buy a paint pad in a hardware store and just use water. I've been using that ever since and just scrub my stamps on that. Works like a charm. Great tutorial!! Thank you! As for cleaning, I never thought at my age I would be buying baby wipes! But they work well. If I am stamping with a bunch of different stamps, I put them in a colander and run them under the faucet. Great tutorial! I agree... Baby wipes rock for stamp cleaning! I have tried several stamp cleaners and to me nothing beats a baby wipe except... the kitchen sink. If I am stamping by myself, I will just get up and walk to the sink and clean my stamps with a little dish liquid and water, then lay them on a dishtowel to dry. thanks for the tips. I have learned the hard way to always stamp first on a scrap piece of paper more than once to determine how best to stamp on the card. And I am getting better at stamping. There is hope! Thanks for the tutorial! 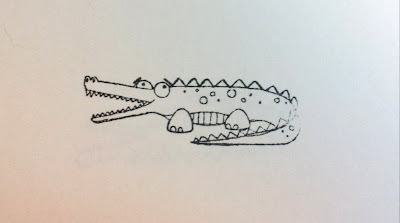 I'm going to try the cushion for some of my acrylic stamps that don't quite "make it" sometimes. For cleaning, I sometimes use a wet paper towel while I'm working, then a baby wipe to "really" clean up when I am done. Glenda F.
Great tutorial. For cleaning my stamps, I go a different route than the baby wipes. I use Simple Green cleanser diluted with water (3pt simple green to 1pt water). I spray it on a cleaning rag and rub stamps across it like a cleaning pad. Takes off any ink and doesn't dry out the stamps. Its great for any other craft clean up you might have too! this is really useful information - especially about the acrylic, "clear" stamps - I love to see where I stamp but was wondering why the images didn't always come out clearly. I will try the foam under the paper. Thanks! 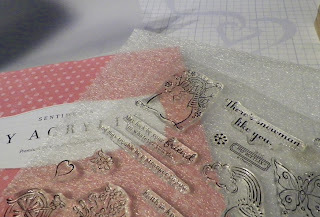 not all acrylic stamps are totally clear (Stampin'Up! comes to mind). Thanks for the very helpful tips! I've been cleaning my stamps with a great all-purpose cleaner from the Dollar stores called Awesome. A little spritz and a rag does a terrific job of cleaning them off. I have one of those scrubby stamp cleaner pads from Hobby Lobby. Turn it over and it is just like a mouse pad, perfect for stamping the perfect image no matter what type of stamp I use. I discovered Memento Ink, too! 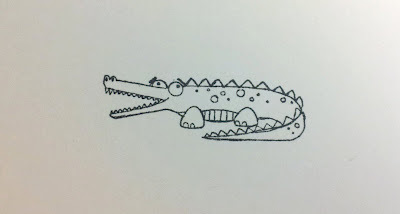 Seems to give me crisper images on paper, use my Stazon ink for other mediums. Thanks for the tutorial! 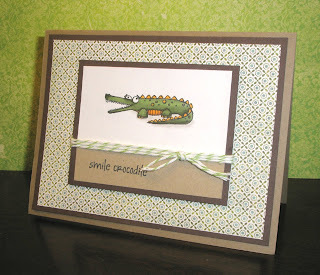 Thank you so much, Nancy, for this detailed tutorial and reminder for all of us stampers. Great post.You share many beautiful stumps. Thank you so much.